Every idiot knows alternative media needs funds to survive because BN government refuses to give them publication permit for printed newspapers. Malaysiakini newspapers circulation will hit 100,000 copies in first three months if the permit is granted to Malaysiakini. 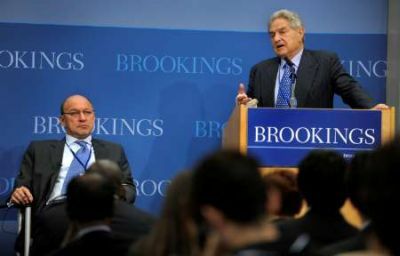 George Soros needs to inject RM 10 billion to buy votes if he wants to control domestic politics. The old man forgot China government has more says on who is Malaysia government after GE13 by blatantly proclaim that BN is China choice. The old man is still naive to believe such petty issues will shift the focus of BN corruption, cronyism and racism from the rakyat minds. KUALA LUMPUR (Sept 23, 2012): Some foreign powers want to push for a regime change in Malaysia by funding local-based, pro-opposition organisations, said former prime minister Tun Dr Mahathir Mohamad. He said, the ultimate goal of the funders was to see the appointment of a leader whom they could put under their thumb. Speaking to reporters here today, Dr Mahathir said that funding by the National Endowment for Democracy and the American currency speculator George Soros-linked Open Society Institute (OSI) — in the name of democracy and freedom — were not only bad but also reflected a hidden intention in wanting to control the domestic politics. The vocal veteran politician was asked to comment on news portal Malaysiakini.com’s admission that it had received foreign funds, including from OSI.